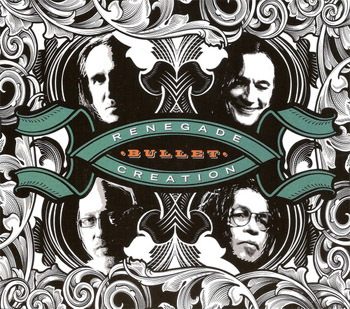 Renegade Creation is a supergroup made up of Robben Ford, Michael Landau, Gary Novak, and Jimmy Haslip and they have returned from a two year absence with their second album, Bullet. Make no mistake about it, these guys are all incredible musicians and they play very well together and Bullet, is proof of that. Their first album was a fantastic debut and with such a delay you would hope for them to build off that groundwork and create something great. There are moments of greatness on this album, but overall it just does not live up to their debut. The first track, “All Over Again” is nice way to set the stage for the album with some scorching playing throughout. The title track follows and it is full of energy with some fine soloing and equally fine vocals by Ford. The vocals blend in nicely with the music and help create a full sound to what might be the finest cut on the album. These guys are not just straight up rockers, they can slow it down too. “Nazareth” is a very powerful track that is all about the acoustic guitar and the strong vocals. These are the finest vocals on the album, you can tell the emotion oozing through. But the strong vocals aside, this album is about the instrumentals. This is an easy album to get lost in the jams, and there are plenty to get lost in. The whole time you listen to this album you can feel the energy and enthusiasm. Just about every track offers you something and that is a plus for the album You can tell that these high caliber musicians are just having fun during this album, and that must have made for some enjoyable recording sessions to attend. But sometimes it does not come together on record. It just seems that they lose a little creative steam during some of the tracks and fall in repetitive traps. They are all extremely talented musicians with impressive credentials, so you think that lulls would not be an issue, but they seep in. Fortunately, there are not a ton of them and they do not last extended periods of time. When they do pop up, it is a letdown because the flow of the album is interrupted. But it is not an indictment of the album, nobody is perfect. Renegade Creation is back after a two year sabbatical. Their new album, Bullet, is one that will appeal to a broader spectrum of people and it definitely has it moments. This is a supergroup, so you know the musicianship is top-notch and that becomes apparent right away. Despite inevitable lulls in the playing where the juices stop flowing, the album is solid and worth repeated listens.